Tropical Cyclone Marcus continues to parallel Western Australia and remain far from the coast, while weakening. 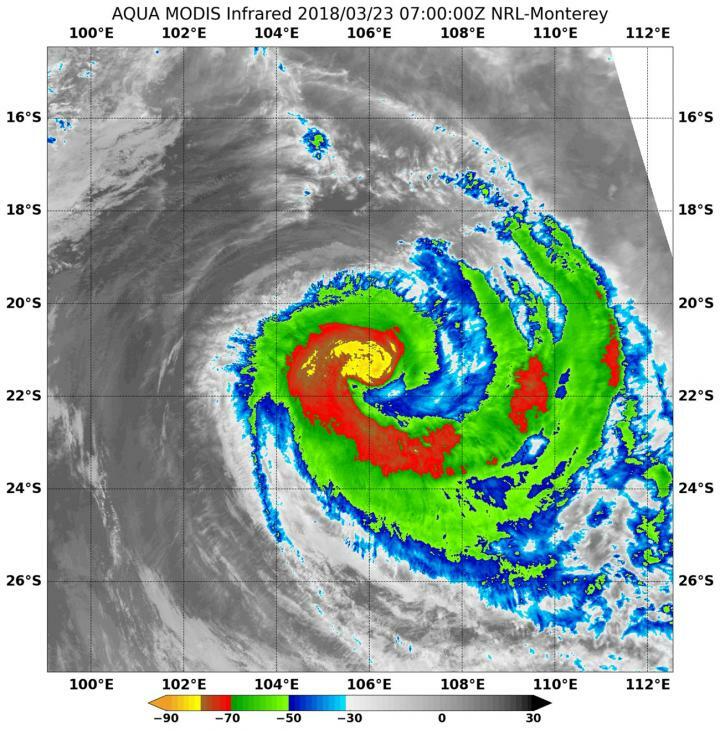 NASA's Aqua satellite analyzed the storm in infrared light and saw a comma-shaped Marcus. NASA's Aqua satellite passed over Marcus on March 23 at 3 a.m. EDT (0700 UTC) and analyzed the storm in infrared light. The MODIS or Moderate Resolution Imaging Spectroradiometer instrument aboard the satellite revealed cloud top temperatures as cold or colder than minus 70 degrees Fahrenheit (minus 56.6 degrees Celsius) in a band of thunderstorms wrapping into the low-level center from the southeast giving the storm a comma-shaped appearance. Generally, cloud top temperatures in Marcus have warmed over the last day indicating that the storm's uplift has weakened. MODIS data also showed a small area with colder cloud tops circling Marcus' center. NASA research indicates very cold cloud tops with the potential to generate very heavy rainfall. Since Marcus is far from land, its rain is falling over the open waters of the Southern Indian Ocean. At 11 a.m. EDT (1500 UTC) on March 23 Marcus was located near 32.6 north latitude and 135.8 east longitude. Marcus was moving to the south at 12.6 mph (11 knots/20.3 kph) and had maximum sustained winds near 92 mph (80 knots/148 kph). By March 24, Marcus is expected to weaken to a tropical storm. The Joint Typhoon Warning Center noted that Marcus is weakening rapidly and will continue to do so as it moves over cooler waters and into areas of stronger vertical wind shear. The storm is expected to dissipate in the next day or two.